Today, Carlos Buhler, Carsten P. Cooper-Jensen and I went to Planter's Valley, South Ghost. We had heard that the rarely formed Anorexia Nervosa (130 m, III, WI4 R) was formed this season and it was thus the main goal of the trip. 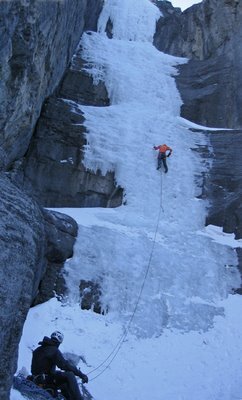 The route was indeed "fat" and Carsten led the first pitch consisting of two thin ice steps separated by a snow field. I then led the second pitch on thicker ice which was quite hacked out - we were clearly not the only ones that had heard the rumors of the good conditions on the route. Never the less, it was an enjoyable route. 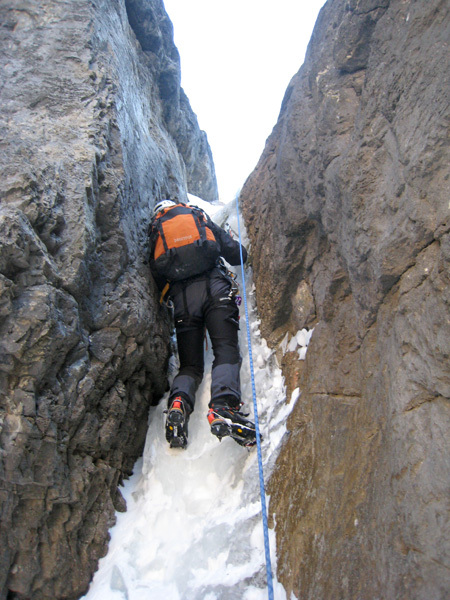 We had spotted a potential new thin ice route 25 meters left of Weithering Heights. Carlos led a long 60 meter pitch which climbed the steep sections of the route. 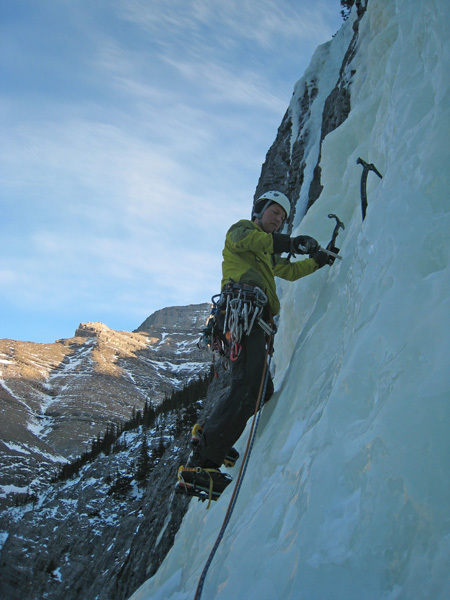 We found ice screw holes and an abalakov anchor so this was clearly not a first ascent. 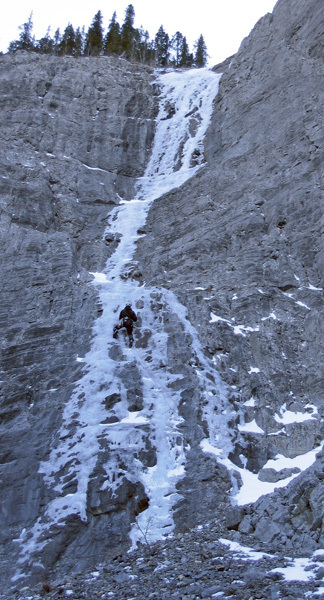 However, it was still fun to climb a route not described in the guide book and even more fun to climb a route with almost untouched ice in contrast to the hacked out ice on Anorexia Nervosa and Weithering Heights. As we reached the bottom of the route we discussed whether to call it a day or also climb the neighboring Weithering Heights (100 m, III, WI4). 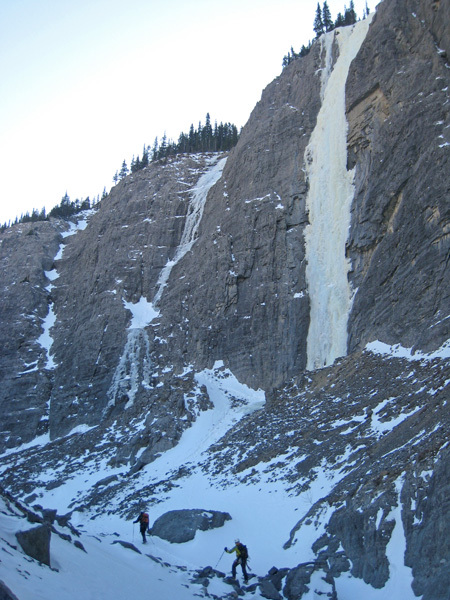 Albeit the route looked kind of boring as it was very hacked out, I was eager to climb at least the first crux pitch. We had talked about climbing the route for weeks and I would thus like to "get it out of my system". 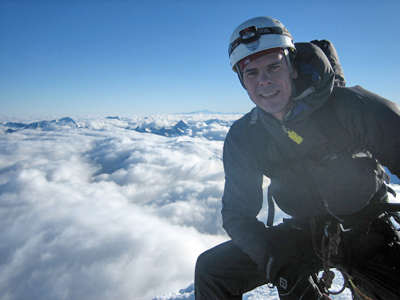 In spite of the late hour, Carsten and Carlos agreed to belay me on the first pitch where after I would rappel the route. The climbing was very easy as I hooked most of the way and I was thus quickly at an anchor. And obviously Carsten and Carlos could then not resist the temptation to climb the route! They thus quickly followed the route climbing next to each other. I had climbed a full 60 meter rope length and made my own anchor of ice screws rather than stop at abalakov anchors below. Carsten thus suggested that it would be easier to finish the route and use the existing anchors rather than make a new anchor. 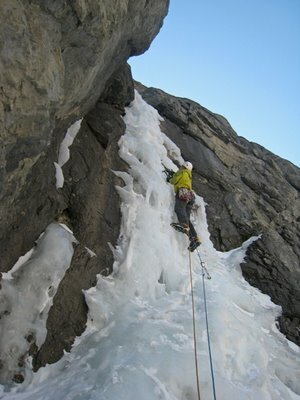 A sketchy excuse for wanting to lead the last pitch! Never the less, we then finished the route and could thus make another tick in the guide book. Anorexia Nervosa (130 m, III, WI4 R). Carsten leading the first pitch of Anorexia Nervosa. Carlos at the crux of the first pitch. 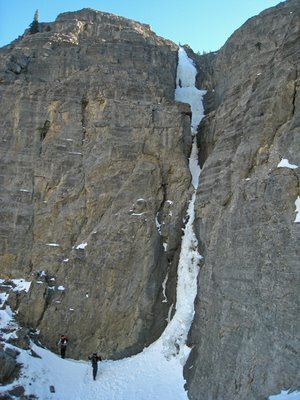 A narrow gully which is often without ice. We were lucky as there was enough ice to make it relatively easy to pass. The author leading the second (and last) pitch. Weathering Heights (100 m, III, WI4) [right] and New Route (60 m, III, WI4 R) [left]. Carlos leading the new route. 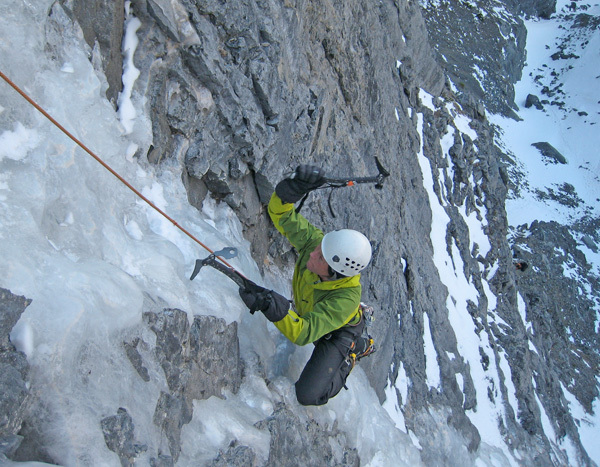 Carsten seconding the new route. Carsten leading the second (and final) pitch of Weathering Heights. As always, the surroundings in the Ghost is just beautiful.